Shopping used to be one of my hobbies. Growing up in suburban Southern California, it was one of the things that my friends and I did when we were bored and wanted some air conditioning. Now, I mostly just shop for food, toiletries, and books. So, it’s kinda funny to be writing a Holiday Gift Guide. Still, I consider myself a maven–from the Yiddish mevyn meaning “one who understands”–and I know how stressful holiday shopping can be. I’m presenting this brief guide in hopes that it’ll make shopping this holiday season a little easier for you. Before I tell you about some cool things to buy, I want you to know about some cool things I’m giving away for FREE. 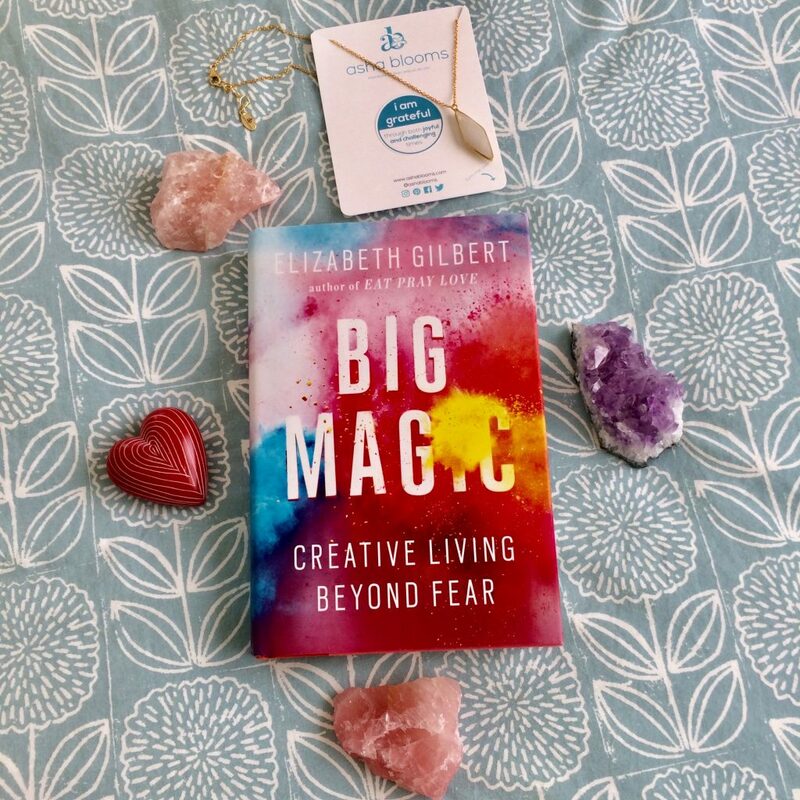 This month, in honor of another year as a full-time creative, I’m giving away of one of my favorite books, BIG MAGIC: Creative Living Beyond Fear by Elizabeth Gilbert, along with the beautiful I AM GRATEFUL necklace ($69 value) by Asha Blooms. Asha Blooms is a Seattle-area jewelry company owned by POC husband-and-wife team, Carol and Amar Gavhane. I love that Asha Blooms creates intentional jewelry–jewelry handcrafted with specific gemstones and intentions in mind–such as the I Am Grateful necklace that features moonstone, a stone that encourages self-discovery, vitality, optimism, and inner peace, and enhances joy and gratitude. To enter the giveaway, simply follow @pegcheng and @ashablooms on Twitter and RT this post by December 1, 2018. I’ll draw one winner on December 2 (U.S. only). Good luck and please tell your friends to enter too! If you’re as entranced by Asha Blooms jewelry as I am, use discount code PEG15 to get 15% off all your orders from November 2018 through January 2019. In fact, I liked their mission so much that I volunteered to be a Brand Ambassador for them. They’re giving me a small commission on every order that uses the PEG15 code. If you have a friend or relative that could use some beauty and intention on their birthday or during the holidays, check out the I Am Collection. You just might find the perfect gift there. I’m offering $20 OFF my Fear & Writing course. It’s normally $65, but with coupon code NOVEMBER, for a limited time, it’s just $45 for 8 days of uplifting, transformative email + video lessons that help people go from thinking/talking about writing to actually writing! When you register, simply click the tiny present icon (box with ribbon on it) to allow for gifting. Akashic Books is offering an amazing 50% OFF all their online catalog from now through December 31, 2018 (some restrictions apply). Just use the code BF2018 when you checkout. If you like mysteries, check out Vancouver Noir, a short story anthology edited by Sam Wiebe, an author featured in my Interviews with Creatives. Also, if you know a parent with young kids, check out the bestselling and radically honest picture book, Go the F*ck to Sleep by Adam Mansbach. I like Akashic Books because they are “a Brooklyn-based independent company dedicated to publishing urban literary fiction and political nonfiction by authors who are either ignored by the mainstream, or who have no interest in working within the ever-consolidating ranks of the major corporate publishers.” Pretty cool, huh? On a budget? Need some nice gifts for less than $10? Look no farther than Alaffia’s Good Soap, available at Whole Foods. I’ve been using this soap made from ethically traded ingredients for years and it leaves my skin feeling softer and smoother than other soaps. Maybe because they’re infused with shea butter and goat milk? (They also have ones without goat milk for your vegan friends.) They have many scents to choose from and my personal favorite is Wild Strawberry. Buy three bars, wrap them in pretty paper, and for $6 + tax, you have a gift that your peeps will love to use! Visit my RESOURCES page to see my top recommended books for writers and creatives. This list is filled with perennial favorites that make great gifts any time of the year. If you know a writer who wants to improve their craft, get them Invisible Ink: A Practical Guide to Building Stories that Resonate by Brian McDonald. If you know someone who wants to change their life but doesn’t know how, consider Better Than Before: What I Learned About Making and Breaking Habits by Gretchen Rubin. And, if you know someone on the brink of burnout, From Coping to Thriving: How to Turn Self-Care Into a Way of Life by Hannah Braime may be just what they need. I hope this guide gave you some good ideas. If you have any questions, comments, or suggestions, please post your thoughts below. I’d love to hear from you. Wishing you stress-free shopping and a joyful holiday season! Note: This post contains affiliate links. 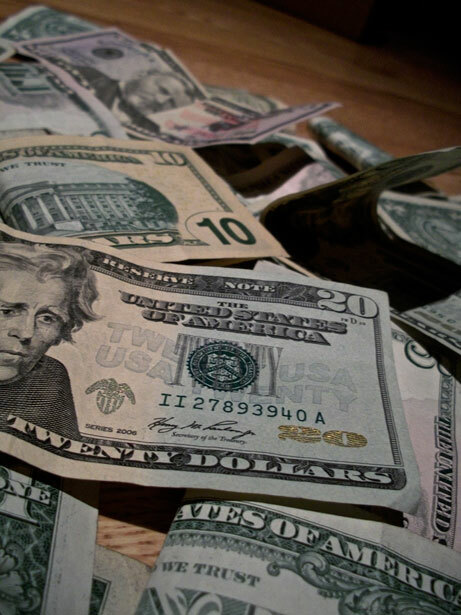 If you make a purchase via one of these links, I’ll be paid a commission at no cost to you, and you’ll be helping me devote more time to writing. Thank you! 2017 got off to a rocky start with my pop-in-law, Mr. Mark, getting very sick in January, and then dying in March. You never truly know how the death of someone is going to effect you until it happens. And even when it does happen, the effects can continue to change over time. While Mr. Mark was sick, and after he died, I ate a lot of Mr. Mark foods. I ate more ice cream, burgers, fries, cheese, mayo, and cookies than I have in years, since I was a child. I did this because, let’s face it, those foods are comforting, and because I felt like I was honoring his memory by eating his favorite foods. Another reason I ate all these foods is because I thought if Mr. Mark can eat these foods all the time and live to 84, why can’t I? ‘Course he had all sorts of health issues, and I have a host of them myself, different ones than the ones he had, but why can’t I enjoy myself by eating whatever I want? Life’s too short. Or life is long and why not enjoy yourself while you can? But after four months of eating like this, my health started to falter. You see, my body has a hard time digesting dairy, wheat, and sugar. I visited Mr. Mark’s grave on Memorial Day and told him I was going to take better care of myself. And, over time, I finally stopped eating those foods. For about a month, I felt better. Then I went back on them after attending another memorial for him in his hometown of Chico, California. Now, I’m back to trying to get off of them again. It’s hard. But I’m trying. What I realize more and more is that life is one big experiment. You try one thing, it works. You try it again, it doesn’t work. You try something different and it’s a grand success. You try something else and it’s an epic fail. So, you go back to the drawing board and you try again. And again. And again. I don’t mind the trying. But I do get upset when I stop trying or when it takes me too long to stop doing something that isn’t working. I’m trying to look at my mistakes as a learning opportunity, not a failure, and I’m trying to be more forgiving of myself. Speaking of trying, here I am in the last half of 2017, and I’m looking ahead and feeling way more optimistic about trying some new things and starting up again some old things. The grieving for Mr. Mark hasn’t ended, but it’s reached a point where it’s not on me like a low-grade fever or like carrying a 5-pound bag of sugar with me everywhere I go. When I look ahead, the number one thing I see myself doing is getting out in the world more. I know Mr. Mark would have supported that. I straddle the line between being an Extrovert and an Introvert (if you’re wondering, I’m ENFJ) but my pop-in-law was an Extra-Extrovert. Keeping that in mind, here are some goals that I’d like to go for during the last five months of 2017. Goal #1: Keep teaching workshops and retreats for writers and creatives. So far, I’ve taught a Writers Wellness Retreat in March, and co-taught a Poetry Makerspace Workshop with Marcus in May. In September, I’m thrilled to be teaching a workshop on Fear and Writing for the Seattle Public Library’s Seattle Writes Program. In October, I plan on teaching a workshop on Creating a Sustainable Writing Practice. If that goes well, I might teach it again in November. Lastly, I want to teach another Poetry Makerspace Workshop with Marcus in December. If you live in the Seattle area, I hope to see you at some of these events. Goal #2: Start blogging once a week again. This time last year, I had written 24 blog posts. This year, this post included, I’ve written just 12. I want to start blogging once a week again. It’s not a quantity thing, but more of a quality of life thing. I stopped blogging weekly because I wanted to have more time to work on my novel. But what I discovered after seven months of not blogging weekly is that I miss it. While I have worked more on my novel, I’m not sure I wouldn’t still have done that even if I had kept blogging every week. You see, I blog for myself as much as I blog for other people. Blogging gives me a regular way to reflect on what I’ve learned, or what I want to learn. It helps me, and it’s valuable to my self-care. So, whether it takes away time from my novel writing or not, I want to keep doing it. Every week. Hope you enjoy the more regular blogging that will be coming your way. Goal #3: Start using videos in my blog. Some people call this vlogging. I want to start creating blog entries with videos instead of writing them all. 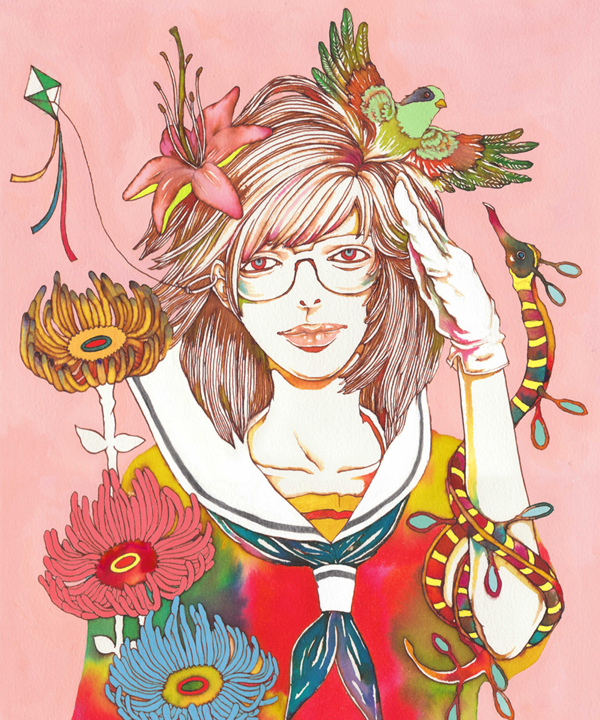 I was inspired when I discovered the videos of awesome illustrator Fran Meneses (aka. Frannerd). Frannerd seems to have so much fun with her videos, while also giving people helpful information about illustrating, and it reminded me of when I ran my law school consulting business, Prelaw Guru, and made quite a few videos and then found that prelaw students loved them. I like sharing my learning in a verbal and visual way instead of just in written form so I’m looking forward to creating videos on writing and the writing life. Thankfully, Marcus has volunteered to help me with my videos (he helped me film and edit the ones I did for Prelaw Guru) and I have a feeling we’re going to have a lot of fun making them. So, stay tuned for some videos coming your way. 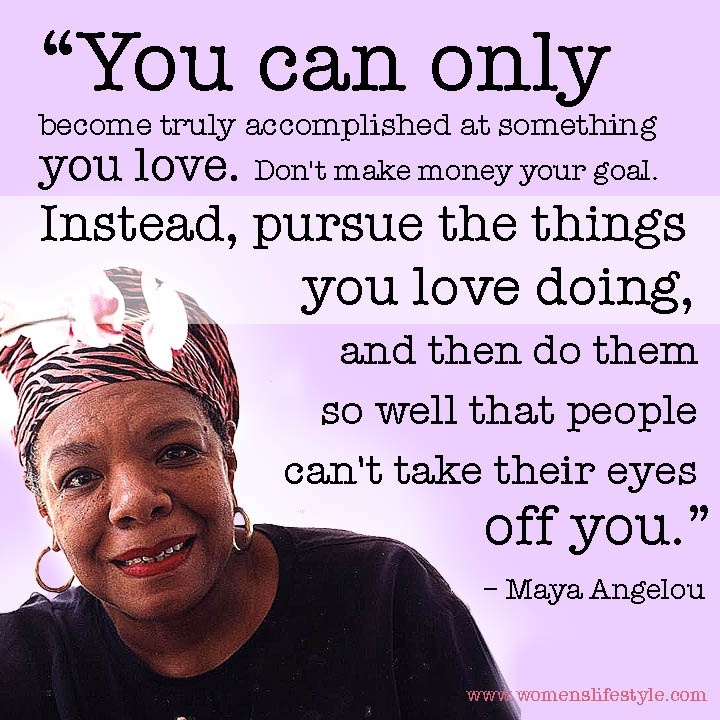 Goal #4: Find other ways to make money. It’s taken me 18 months of full-time writing to realize that depending or expecting my novel writing to make me money not only fills me with massive amounts of guilt (what if I can’t do it and Marcus has to keep supporting me for years and years?) and fear (what if I can’t do it no matter how hard I try? ), but it also limits my creativity. I want to create works that I love. I hope that other people love them too but I can’t count on that. All I can do is create the best work I can possibly create, and then work on getting it out there. I’m not an artist that gets mad when other people don’t “understand” my work. My goal is to create stories that are understood so much that people can’t help but tell their family and friends about them. Still, I’m not writing stories that I think will sell. I’m writing stories that I most want to tell. Because I find writing both glorious and hard, I need to write stories that appeal to me, otherwise it’s not worth the thousands of hours of unpaid work I put into it. So, while I do hope my books sell well enough someday to support me, I’m researching some options right now that will help me make money while I get better at my craft. I’m not going to reveal them right now but I will someday. I wasn’t planning on it–I was trying to make today a day of relatively “clean eating”–but I ate an orange-chocolate-chip cookie this afternoon that was so good, I cried out with glee. I think Mr. Mark would have loved it. I was given this cookie (it was the last one) at a document-shredding event at my bank (thanks WSECU), I have no idea where they got it, and I’m not sure if I want to know because then I’d be there all the time. As I move forward, I realize I don’t have to cut out every single Mr. Mark food from my diet, I just have to savor the ones that I do have, the few times that I have them. I can remember him in other ways that have nothing to do with food but can be just as satisfying. I know he’d support that. For the rest of 2017, my work is cut out for me: remember Mr. Mark in healthy ways, take good care of myself, get out in the world more, and keep on trying. Today, I looked up the royalties I’ve earned from the first month of sales of my first novel, The Contenders. Why am I dancing and pumping my fist over such a small amount of money? Because that’s forty greenbacks for a product of my creativity. That’s forty George Washingtons for a story that I made up. Do you realize how incredible that is? Today is a day for celebrating! Here’s the breakdown for those of you who like numbers. For you indie authors out there, notice how the royalty for my $2.99 ebook at $2.07 is not far off from the $2.55 royalty for my $8.99 paperback. As many indie authors are proving over time, ebooks are the way to go for generating revenue. Still, I love reading paper books (and so do many readers) and will always offer a printed version of my fiction. I earned nearly $40 in my first month of sales (really, just two weeks since it was released on July 17th). Who knows what next month and next year and the next four years will bring? No matter what the totals are, my creative endeavors are now making me dough.